"Solutions to Steam Heating Problems"
G.D.T. Associates, Inc. is a manufacturer's representative established in 1986. We provide high quality electro-mechanical equipment used to control, conserve and enhance the flow of steam and condensate for the purpose of heat transfer. At G.D.T. we work with consulting engineers, wholesalers, mechanical contractors and building management personnel throughout the Metropolitan Area to create and employ solutions to the challenges of energy efficient steam distribution. Our primary product lines are comprised of steam traps in NYC manufactured by Barnes & Jones Inc. and condensate handling systems in NYC manufactured by Skidmore Pump Co. All equipment is manufactured domestically to ensure the highest quality and timely delivery. The senior staff at G.D.T. possesses over 100 years of combined experience supplying and maintaining equipment that is required for all types of sub-atmospheric steam heating systems. We specialize in diagnosing and solving problems associated with variable-vacuum steam distribution equipment. 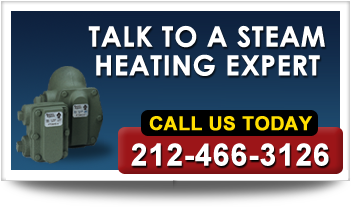 Stay up-to-date with the latest information on Steam Heating Solutions in NYC!